From fedoras to stubble and sunglasses to low-slung trousers. Join Capital as we round-up some of the trademark looks of the biggest pop stars in the world. 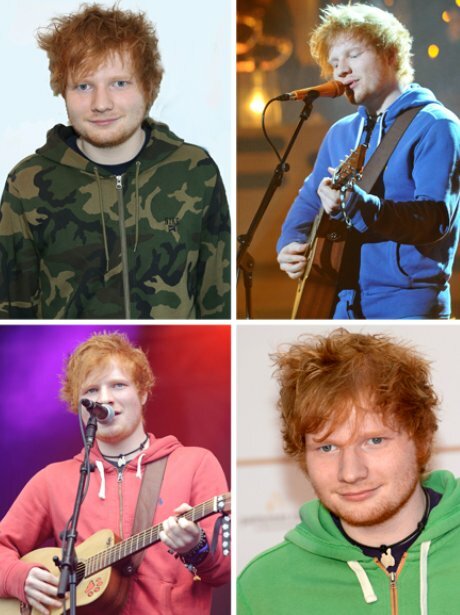 It's only at the swankiest of award shows you'll catch Ed without one of his trusted hooded jackets! The 'Little Things' star's barnet is the envy of all men and enough to send sales of shampoo and conditioner through the roof. You'll be hard pressed to find this rapper going out in anything that glows in the dark. Just be careful when you're walking at night - you might need that high-vis jacket after all. If you look up the word catsuit in the dictionary you'll see...well a definition of the word, but what should be there is a picture of Jessie in one of her signature all-in-one pieces. The One Direction man is too busy to pick up a razor - and let's just be thankful that's the case so we can swoon all day and night over the rough and ready look of this boy band star. The One Direction star has made trouser braces HIS trademark over the past two years, and seems to have an ever-growing collection of the accessory, with all different shapes and styles at his disposal! It may be on trend right now, but there's truly only one lady who defines the beanie and that's Ms Ora! The 'Locked Out Of Heaven' is rarely spotted without his trademark head-piece. We bet it stands pride of place at his bedside - it deserves to be! The 'Scream & Shout' rapper has had a number of look over the years but the one he will always be known for is his short cropped hair... complete with a right angle wedge cut out of one side! Anyone can wear a baseball cap in the traditional fashion - but that's not good enough for the N-Dubz man. He always likes to put his own spin on fashion and that is quite literally the case with this trademark piece. The 'Bad Romance' singer might be known for her choice of extravagant outfits, but the glamour doesn't stop there. The US star always likes to give a typically Gaga twist to her eyes to make sure all eyes are firmly on her. On stage, at night, indoors, outdoors - yep the rapper always looks the perfect rockstar with his eye wear. No wonder she has a string of admirers as big as her number of hit singles. With those luscious and striking red lips, it's no stars such as John Mayer, Harry Styles and Taylor Lautner have all fallen for the country singer. It's almost as recognisable as her piercing and titanic vocals - but we can't imagine Florence without her signature red locks on full show. The 'Hear Skips A Beat' star seems like he doesn't feel comfortable without his trademark hat... and makes sure he always has one to hand when he's out and about! She most probably spends more on glitter in one week then anyone else does in their lifetime but we're sure glad she does. The singer also revealed recently that she has an entire bathtub of glitter on her rider. Those arms are quite literally too much for any t-shirt to hold and the only tool for the job is a trusty tank top! You'll never catch this pop star sporting a pair of skinny jeans anytime soon, he has to be careful they don't fall down though - but luckily there's an army of Beliebers who would be happy to help him out. It's become her signature 'go to' award outfit and no one rocks the little black dress quite like Adele. Besides, she's usually picking up a gold award and it just matches perfectly! The 'Read All About It' rapper has a large scar on his neck with the word 'Lucky' tattoed over the top, which has gone on to become one of his most famous tattoos! Even her album titles can't escape the pink effect. Forget Barbie - the true queen of the colour has to be Nicki. The 'Standing In The Dark' four-piece all have different looks and talents but there's one thing that links them all (apart from being in one of the UK's hottest new acts!). They all love a nice low-cut t-shirt! It's sometimes difficult to keep up with the Bajan star's latest haircuts but one thing that you can always rely on is a pair of trusty hooped earrings to compliment her new do.